The all-school reunion this past weekend reunited eight graduates from the class of 1941 - the highest turn out from a single graduating class - for their 65th reunion. It didn't take long for memories of school days to begin flowing from the PHS Class of 1941. The all-school reunion this past weekend reunited eight graduates - the highest turn out from a single graduating class - for their 65th reunion. 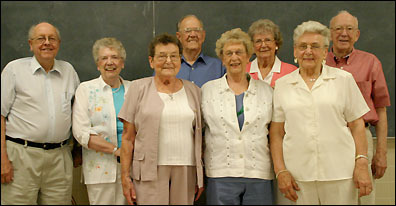 Members of the Class of 1941 attending their 65th reunion at the all-school reunion on Saturday were, from left, George Farnum, Gloria (Young) Ringstad, Valaria (Zapf) Conrey, Math Mimbach, Dorothy (Gale) Tinglor, Audrey (Schroeder) Lang, Doris (Weidner) Miller, and Duane Blumn. The all-school reunion - sponsored by the "Keep the Quality" School Foundation and the first in Paynesville since May 1992 - featured the Distinguished Alumni banquet on Friday night at the American Legion; school tours on Saturday at the school buildings, including lunch at the high school, an iMovie (created by Shawn Reinke, Class of 2006) in the auditorium, and an old trophy auction by the Bulldog Booster Club; general socials on Friday and Saturday nights at the Legion and Queen Bee's Bar and Grill respectively; and informal gatherings of alumni throughout the weekend. 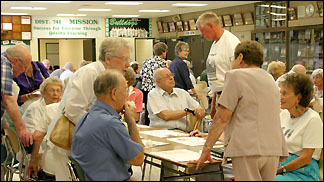 The Class of 1941 has been meeting every year since their 50th reunion, marking this year as the 15th consecutive year they have reunited annually. Eight of the 45 graduates from the class attended the all-school reunion on Saturday. Of their original number, 23 are now deceased, eight were unable to attend due to illness or distance, and the status of six was unknown. Dorothy (Gale) Tinglov said she came home for the reunion because, "I thought it was going to be the last one, with 65 years." Their reminisces about PHS and their school days included humorous stories, World War II, corporal punishment, sports, and the value of education. Doris (Weidner) Miller lived in Regal and transferred from a one-room schoolhouse to Paynesville in the eighth grade. Miller remembered taking home economics when a pot roast slid across the floor one day. The teacher told them, "If you don't say anything, you'll all get an A+." "We just had a lot of fun in high school," said Valeria (Zapf) Conrey, who lives in Gresham, Ore. "Doris and I, we used to write poetry together." Conrey agreed that her classmates, as a group, had a great sense of humor. "We had to," she joked. "We had fun. No matter what we did; we had fun." "We were the fun class," added Tinglov. Math Mimbach agreed. "We had a unique class," he said. "We all united and worked together. It was just fun to get together." One classmate, who did not attend their reunion on Saturday, wrote prophecies in 1941 about the careers he envisioned his classmates pursuing. "I'll tell you, all of those came true," Mimbach said. "Phil Heitke and I were supposed to be the business people, and we both were." Now retired, Mimbach bought Fleet Supply in St. Cloud, running it for many years and employing 320 people. "I would follow in the steps of my father and become a postman, delivering love letters," said Bluhm recalling the inscription in his 1941 PHS year book, which came true. Gloria (Young) Ringstad's family moved to Paynesville from Chokio in 1937 when she was a freshman in high school. Ringstad recalled crying every day after school for the first few weeks. "I came as a freshman in high school with this bunch," noting that the class seemed "very cliquey." The Japanese bombed Pearl Harbor six months after their graduation, drawing the United States into World War II. Their class lost two in WWII: LeClare "Bud" Olsen and Raymond Worm. George Farnum was born and raised in Paynesville, living here all his life except for the three years he spent in World War II from 1942 to 1945. Duane Bluhm also served in WWII in the South Pacific from 1942 to 1945. The Class of 1941 and other alumni, including Peter Jacobson of Paynesville, spent time reminiscing during the lunch at the PAHS cafeteria on Saturday afternoon for the all-school reunion. Bluhm recalled daring Olsen to hide in the closet of Ms. Goodrich, who was the the physical education teacher. "The one thing that always comes back to mind," Bluhm said, "is when she opened her closet door and Bob said, 'Boo!' We didn't have class the rest of the afternoon." Audrey (Schroeder) Lang remembered passing notes back and forth with a friend in grade 11 and getting caught by Mrs. Hendrickson, the English teacher. "The teacher took the note and made me stand and read the note I wrote," she said of her punishment. Tinglov recalled receiving a whack on her elbow with a ruler. "...And down I went," she said of the fainting spell she was known for among her classmates. "What you remembered was the good teachers. You don't remember the ones that let you slide by," said Miller. Mimbach remembered his favorite teacher and coach, Elber "Ding" Wendlant, who coached him in football, basketball, and baseball and also taught German. "He coached everything with one assistant," Miller recalled. "And taught besides," he added. Mimbach's basketball team, coached by Wendlandt, won district titles in 1940 and 1941, the only district titles in basketball in school history. Mimbach said his three sports took a lot of practice and he remembered that the bus driver held the bus until practice was finished. "'37 was the first year they had bus service for the country kids," Mimbach said. "The bus would wait for me after school, and oh, boy! Everybody was beefing about that." Ringstad said there are scholarships available for high school students today that were not available when they were seniors, adding "for women, when we graduated, we either had to be a nurse or a teacher or a secretary or clerical or we got married. And that was it." Tinglov said, "In 1941, we didn't have the money like they do in 2006." She offered, "Save your money and keep your nose in the books." Farnum, sharing words of wisdom for the Class of 2006, added that education "makes all the difference in the world."